You'll be £19.99 closer to your next £10.00 credit when you purchase Emulating Alexander. What's this? This book gives an account of the Roman relationship with Persia and how it was shaped by the actions of Alexander the Great long before the events. Numerous Roman emperors led armies eastward against the Persians, seeking to emulate or exceed the glorious conquests of Alexander. Some achieved successes but more often the result was ignominious defeat or death. Even as the empire declined, court propagandists and courtiers looked for flattering ways to compare their now-throne-bound emperors with Alexander. All the while there was a small segment of the Roman intelligentsia who disparaged Alexander and his misdeeds. While the Romans dreamed of conquering the Persian realm, the Persians of the Parthian and Sasanian dynasties dreamed of regaining the lands of the eastern Mediterranean snatched from their Achaemenid ancestors by Alexander. Echoes of this revanchist policy can be seen in Irans support of Shiites in Iraq, Syria, Yemen and Lebanon. Glenn Barnett draws comparisons between the era-long struggle of Rome and Persia with the current wars in the Middle-East where they once fought. Glenn Barnett gained a BA in History from California State University in 1968 and went on to a varied career as a school teacher and then in the aerospace industry. He has had numerous articles and several books published on various historical subjects and, returning to CSU later in life, he gained his MA in 2012. 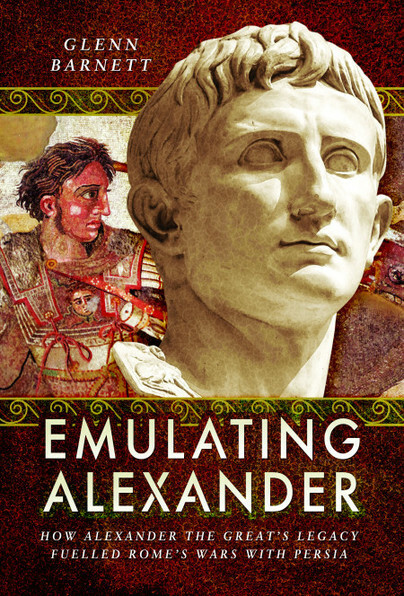 Emulating Alexander expands upon his MA thesis.